The Mercedes C class was named Germany's top compact executive car. MUNICH – Mercedes-Benz is the first non-Japanese automaker to take top honors in vehicle ownership satisfaction among German car owners, according to a J.D. Power and Associates study published June 24. Either Toyota, Honda or Daihatsu has finished No. 1 in the study between 2002 and 2009. Mercedes broke the streak by earning 838 out of a possible 1,000 points. The Stuttgart-based automaker excelled in two of the study's four key measures: vehicle quality and reliability, and vehicle appeal. The other two factors used to rate the brands are ownership costs and service satisfaction. At the segment level, the Mercedes C class was named top compact executive car and CLK ranked as the best sports car. At the bottom of the list of ranked brands were No. 25 Fiat and No. 24 Chevrolet. Last year's No. 1 brand was Daihatsu, but this year the Toyota small-car subsidiary was not ranked due to small sample size. The other brands not ranked for this reason were Alfa Romeo, which tied for No. 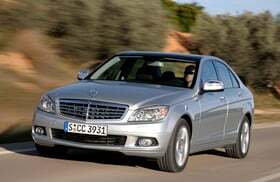 2 with Mercedes in last year's study, Chrysler, Dodge, Jeep, Lexus, Porsche, Saab and Subaru.